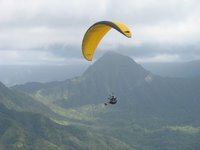 Several of the island's leading slackers met today at Punaluu and flew their heads off, capping the day with a bladder-busting downrange mission to Hauula Beach Park. I'm talking about hours in the air, all up and down the ridge, featuring touch and gos, top-landings, spirals, and multiple bay crossing attempts. It was a gorgeous day to be in the air and the little XC trip just put the icing on the cake. Best of all, the Slackers proved to be veritable paragons of safety! (We don't need to bring up the blown launches, the wing wrapped around a coconut palm after landing, or the maniac who was kiting without a helmet on the seawall at the beach park). Thanks to my fellow slackers for a great day: Don (El Presidente of the Slacker Society), Mad Dog, and Suicide Pete. I want to be a slacker too. Bob, you are a pillar of the Slacker Society; you're just on injured reserve at the moment. I, OTOH, can only dream, at this point, of joining.